Wherever your active life takes you – to the weight rack of your favourite underground gym, the local park where you and your buddies play ball each week, or the kickboxing studio that has you sweating buckets every time – you need a steady stream of essential micronutrients to perform your best. You can find this nutritional support in STRONGMAN® – an enhanced daily vitamin and mineral supplement for both men and women. Like its name implies, STRONGMAN is a nutritional powerhouse. It provides all the essential micronutrients your body needs to boost performance, optimize muscle building, and improve overall wellness. 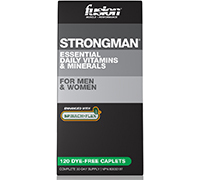 While STRONGMAN has been a trusted daily supplement for years, it is now exclusively available in dye-free caplets and smaller, more environmentally friendly packaging. Optimize performance – in the gym, on the field, or wherever your active life takes you. Kick-start muscle growth – for a stronger, more muscular frame. Speed and enhance recovery – so you can get back to your sport that much sooner. Boost metabolism – to promote faster fat burning and more noticeable definition. STRONGMAN contains proven ingredients to help enhance immune function. The stronger your immune system, the easier your body can fight off infection and illness – keeping you in a healthier place to stay on track with your bodybuilding, fitness, or sports program. STRONGMAN is a great source of antioxidants, which help fight against free radical damage and maintain good health. While certain foods are high in antioxidants, STRONGMAN takes the guesswork out of how much to consume and when. STRONGMAN aids in connective tissue formation, while reducing joint pain and inflammation. With healthy joints, you’ll feel more flexible (and less stiff) when working out, playing sports, or going about your daily activities. Daily vitamins are a dime a dozen, so what makes STRONGMAN so unique? Think green! Unlike all other products of its kind, STRONGMAN contains a proprietary compound called SPINACH•FLEX®. If you’re having flashbacks to being force-fed spinach as a child, don’t worry. This version is completely painless! 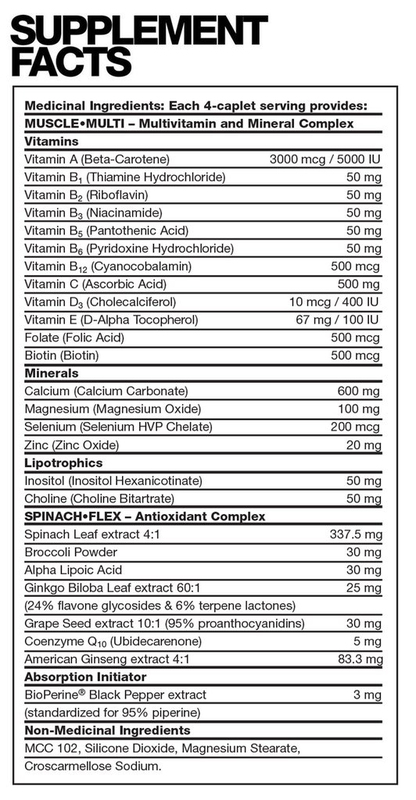 Per box, SPINACH•FLEX contains the equivalent of over 6 cups of spinach, in addition to other concentrated greens. Why is that so important? Spinach is packed full of vitamins, antioxidants and minerals, which can help keep you at your healthiest and fittest. SPINACH•FLEX also helps speed the recovery process after a grueling workout or other intense physical activity. Along with SPINACH•FLEX, STRONGMAN contains one other powerful complex – MUSCLE•MULTI®. This complex works synergistically with SPINACH•FLEX to enhance nutrient delivery, support energy utilization, and halt free radical damage to muscle cells. Q. Why is it so important to take STRONGMAN? A. Developing a lean, healthy body doesn’t end in the gym or on the field. It is also dependent on consuming enough micronutrients throughout your day. Micronutrients are the vitamins, minerals, and other biochemical compounds your body needs to function properly and efficiently. Even if only one of these critical substances is deficient, your progress can be halted in its tracks. In fact, without these vital micronutrients, nothing happens. STRONGMAN helps keep your body “topped up” with these micronutrients so you are always in a place to get stronger, healthier, and fitter. Q. Who should use STRONGMAN? A. STRONGMAN has been developed for bodybuilders, athletes, fitness enthusiasts, and everyday wellness seekers alike. In short, if you’re trying to live a fit, healthy lifestyle (and look great while doing it), STRONGMAN is for you. Also, it’s important to consider your diet. Even with eating regularly, you’re probably not taking in the wide variation of foods you need to get all the vitamins you need naturally. Without the right micronutrients, your body can’t perform at its peak efficiency. With STRONGMAN, you get the micronutrients you need to help fill the gaps. Of course, please read and follow the label and talk to your health care practitioner before use if you have any concerns. Q. Can women use STRONGMAN? A. Yes, any active woman looking to improve performance, boost energy and recovery, and build a fitter, more attractive figure, will benefit from using STRONGMAN. STRONGMAN’s unique formulation is designed with everyone in mind, which means it does not contain any ingredients that would benefit only male consumers. Q. Can STRONGMAN be stacked with other FUSION MUSCLE products? A. Absolutely. STRONGMAN should be a regular staple of your current nutrition program and can be combined with any FUSION MUSCLE product. This daily essential micronutrient can optimize your macronutrient intake, ensuring efficient and full utilization of all the food you need for maximum fitness. Q. How do I take STRONGMAN? A. Take one serving – 4 pills – once daily with an 8-ounce glass of water. To maximize absorption of all micronutrients, this supplement should be taken with a meal, preferably breakfast. Read the entire label before use and follow directions. Directions: Take your STRONGMAN 4-caplet serving in the morning with breakfast.